If you answered yes to any of the above, check out these seven guys who crunch mountains of polling data so you don’t have to. They don’t have crystal balls, but they might just have the next best thing. (Referring to this.) 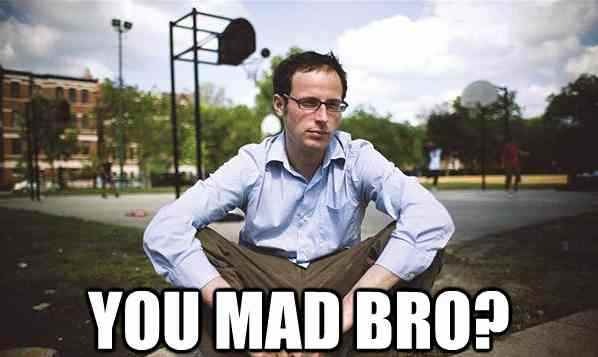 Nate Silver; quickmeme.comThe New York Times‘ statistics big shot has established himself as the gold standard for electoral prognostication. Romney fans are very upset with him for saying Obama has a strong chance of winning (and for being a sissy-man or something). Nail-biting Obama supporters hit his site for daily (or hourly) doses of reassurance. 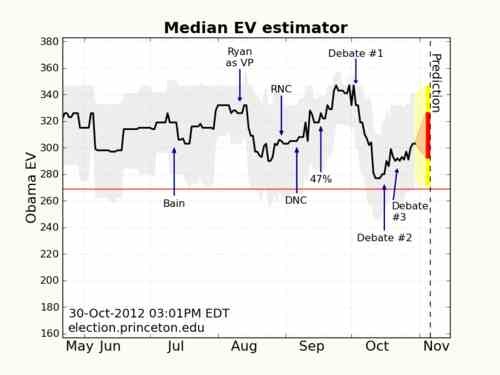 Both sides tend to ignore that Silver’s model doesn’t write off possibility of a Romney win. Track record: Silver has built his reputation on the accuracy of his “Political Calculus”: In 2008, his model correctly predicted the electoral outcome in 49 of 50 states, and long before the 2010 midterms, he forecasted a Republican sweep. Current prediction: Silver’s FiveThirtyEight gives the president a 77.4 percent chance of winning, with a estimated total of 299 electoral votes. Wang runs the Meta-Analysis model for the Princeton Election Consortium. Wang, who made a name for himself in neuroscience and biophysics, took the statistical analyses he’d applied in those fields and transposed them to the mess of electoral politics. He developed the model in 2004 initially to help predict the most strategic way to allocate of campaign donations. The model, based on a slew of state polls, calculates each candidate’s probability of winning in the Electoral College if the election were held today. Current prediction: As of October 30, Wang gives Barack Obama a generous 92 to 98 percent chance of reelection, and an estimated 303 electoral votes. Linzer, an assistant professor of political science at Emory University, runs the polling analysis and forecast site Votamatic.org. It tracks public opinion trends for the two presidential candidates in each state, and also “forecasts ahead to Election Day” using a unified model. 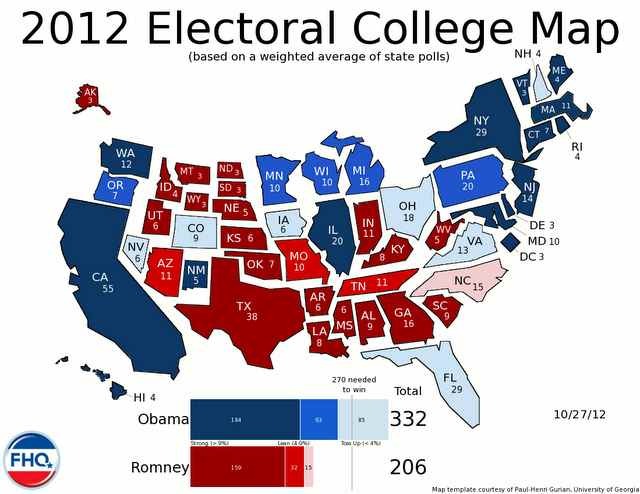 Current prediction: As of October 30, Votamatic is predicting an Obama victory, with 332 electoral votes. Current prediction: With a week to go, Tanenbaum’s analysis has Obama up with at least 280 electoral votes. FHQPutnam, a visiting assistant professor of poli sci at Davidson College in North Carolina, runs the Frontloading HQ blog on state polls. Track record: Putnam was an ace at delegate math during this year’s particularly messy Republican primaries. (He teamed up with The New Yorker‘s Ryan Lizza to count delegates). Current prediction: Putnam’s model has Obama leading with 332 electoral votes. Track record: His track record and methods have been pretty solid—even winning him an endorsement across the aisle from Prof. Tanenbaum at Electoral-Vote.com: For instance, in 2008, his formula projected an easy Obama win, but was off by two states (Indiana and North Carolina). In 2004, his model predicted Bush netting 289 electoral votes (he ended up with 286). Current prediction: His math shows a substantial lead for Obama, clocking in at 290 electoral votes, but with 48.9 percent of the popular vote versus Romney’s 49.6 percent. Holbrook, a professor of government at the University of Wisconsin-Milwaukee, runs the Politics by the Numbers forecast. Track record: He took his models out for their first spin during the 2008 election, estimating a big Obama win with 349 electoral votes, to McCain’s 189 (Obama snagged 365, McCain 173). 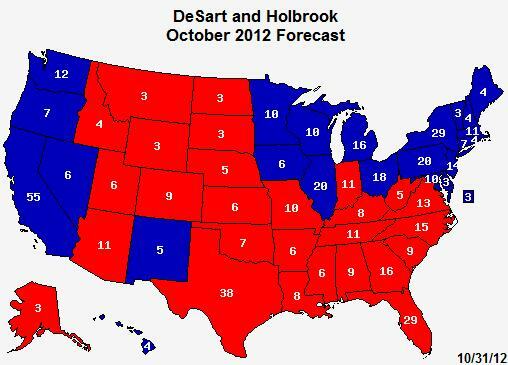 Current prediction: Holbrook gives the president an 86.69 percent chance of winning reelection, with 281 electoral votes to Romney’s 257. Are the Polls Undercounting Latino Obama Backers?